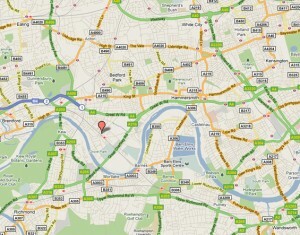 My practice is located in a quiet, largely, residential area of Chiswick in West London. Chiswick train station is a two minute walk away and buses and taxis are plentiful. Turnham Green, Chiswick Park, and Gunnersbury underground services are nearby. There is ample parking (with no restrictions) if you come by private transport. I see clients at my Chiswick practice from across West London, including: Shepherds Bush, Hammersmith, Barnes, Mortlake, Sheen, Richmond, Kew, Brentford, Ealing, Acton and Isleworth.